Kentucky Oaks: Rachel’s Valentina Looks to Make History Twice by Casey Laughter– History is made every year when the Kentucky Oaks field crosses that finish line at Churchill Downs, but this year could offer up an even better connection to history. Rachel Alexandra wowed the racing world in 2009 when she easily won the Kentucky Oaks by more than twenty lengths. I also use the word easily sparingly, because Rachel Alexandra won that race in such a way that needs a more lightly loaded meaning. The superstar filly went on to win many other prestigious races including the Preakness Stakes and, Haskell, the Woodward. Rachel’s Valentina (pictured above on May 4 at Churchill Downs) comes into the Oaks as a lukewarm favorite after finishing second in her last two races: the Breeders’ Cup Juvenile Fillies and the Ashland Stakes. However, this year, Rachel Alexandra will be connected to the Oaks in a few ways. She is represented by Venus Valentine, winner of the Rachel Alexandra Stakes at the Fair Grounds, and then the direct connection comes from her flesh and blood, Rachel’s Valentina. Rachel’s Valentina comes into the Oaks as a lukewarm favorite after finishing second in her last two races: the Breeders’ Cup Juvenile Fillies and the Ashland Stakes. However, Todd Pletcher has been tightening the screws on this filly very well ad seemingly has her ready to shine. Trainer Todd Pletcher referred to the filly as “racing royalty,” as that is exactly what she is. “It would be like the queen having a daughter. 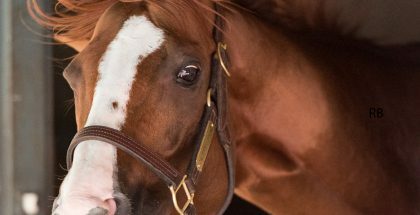 It is amazing to have a horse that good with that type of pedigree.” Rachel’s Valentina is the daughter of not only one Preakness winner, but two. Her sire, Bernardini, won the 2006 Preakness Stakes, which is often overshadowed by the tragedy of Barbaro that engulfed the racing world. Rachel’s Valentina comes into the Oaks off that tough second place finish in the Ashland Stakes, where she fought hard to just miss the win, getting caught by late-running Weep No More. Rachel’s Valentina could also validate the “second off the layoff” theory, where a horse runs their best race in their second start following a lengthy layoff. If she could do so, it would be a grand occasion. We all have seen what Todd Pletcher can do when asked to tighten the screws on his top horses at the moments marked as crucial. The filly is one of three in the Kentucky Oaks for owners Stonestreet Farm, who also own Royal Obsession and Terra Promessa. Terra Promessa dominated the Oaklawn prep races while Royal Obsession earned her was in with a second place finish in the Gazelle Stakes at Aqueduct. Regarding Rachel Alexandra, she spends her days with some of Stonestreet’s retired broodmares and still receives loads of attention. When Banke was asked about potentially breeding her star mare, her answer was simple, responding with “probably” in an interview with the Courier-Journal. If Rachel’s Valentina were to win the Kentucky Oaks, it would mark the first time a Kentucky Oaks victor was produced from a Kentucky Oaks winner in the 142-year history of the race. What a story that would make!